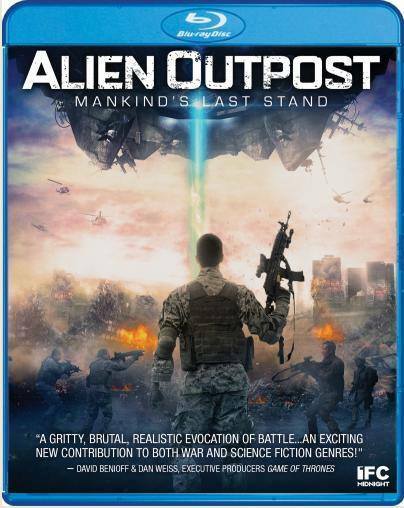 ALIEN OUTPOST: A Fresh Slant On Found Footage – Schlockmania! The “found footage film” inspires weariness in a big segment of horror fans, probably because so many of them are mere carbon copies of the few genuinely successful found footage hits like The Blair Witch Project or Paranormal Activity. However, any cinematic style can be appealing if the filmmakers apply enough imagination to it and thankfully this is the case with Alien Outpost. Don’t let the corny SyFy Original Movie-style title throw you: it uses the found footage subgenre to mix genres and breathe new life into familiar tropes. Alien Outpost begins with a prologue that establishes a future in which our planet has survived an attack by alien forces. Enough years have passed that the international alien defense force that was formed after the attacks is being phased out. 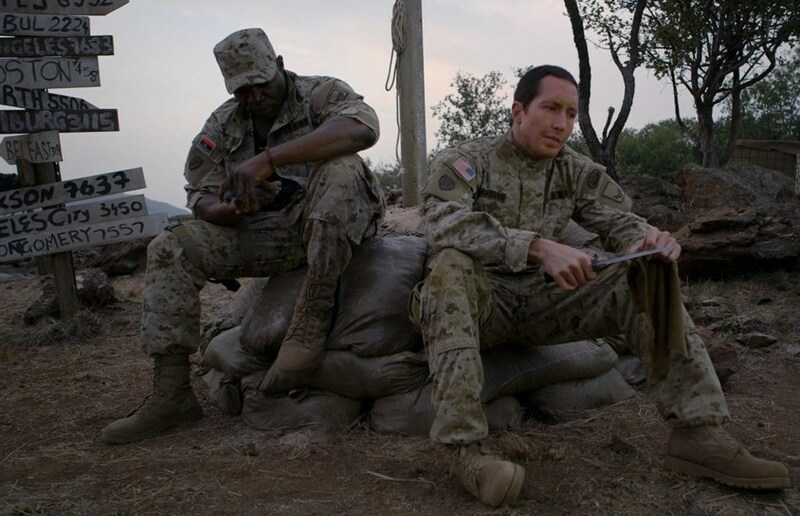 A pair of documentarians travel to a base in the Middle East to see one the last outposts. 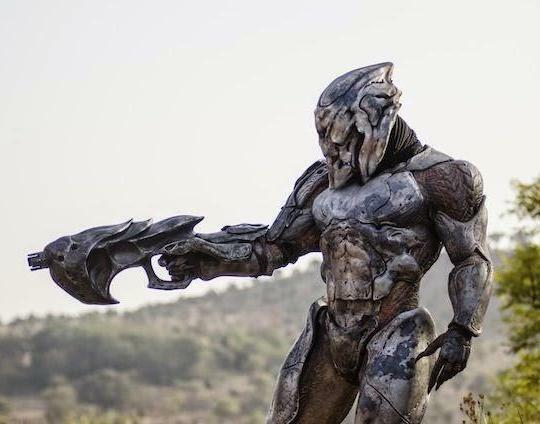 The soldiers there spend more time fighting insurgents than they do the aliens – but the few aliens still left on earth have a few sinister tricks up their sleeves that no one is expecting. 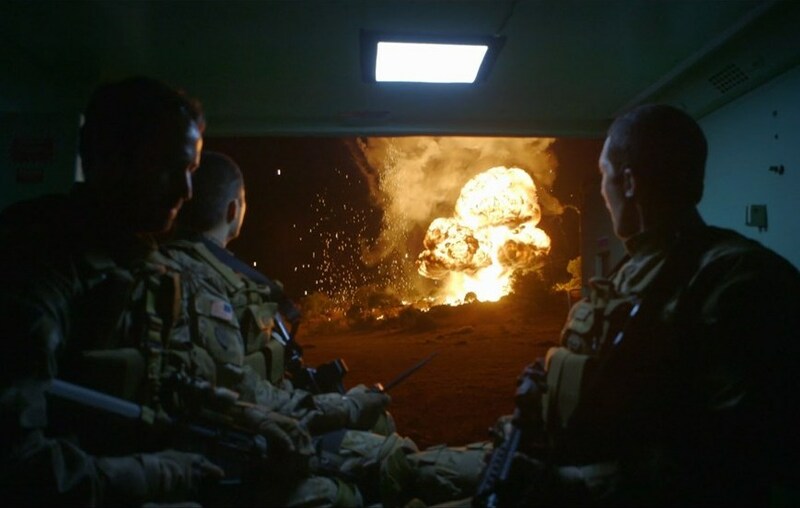 The resulting film uses its found footage format to find a fresh angle on war movie and alien invasion movie elements – and it works better than found footage skeptics might think. For once, the found footage format isn’t used as a way to avoid having a plotline or good dialogue. In fact, the script by cinematographer Blake Clifton is intricately structured, mixing in-the-field scenes with sit-down interviews of the characters and title cards that fill in informational gaps. One might quibble that the characters are familiar war movie types but Clifton is careful to give them all arcs and get the audience on their side as the aliens begin to show their hand. A lien Outpost further benefits from smart direction by Jabbar Raisani. Rather than allowing the found footage approach to dictate his style, he cleverly works out how to mix nice compositions and variations in angles into a handheld documentary approach so the results aren’t as fatiguing to the eye as this style usually is. He also draws upon his visual FX background to provide a convincing backdrop for the CGI, mixing in a surprising amount of practical effects to give the warfare some visceral reality. Raisani also does well with his cast, all of whom give committed performances. Rick Ravenello is a standout as Spears, the commanding officer: he gives the square-jawed hero a quiet dignity that allows the audience to develop a respect for the ch aracter and the tough decisions he has to make. There are also colorful supporting turns from Joe Reegan as a cool-under-fire soldier who joins the unit, Justin Munitz as a gung-ho German soldier and Reiley McClendon as a tough guy who shows some emotional vulnerability in the latter stages of the story. The characters are all familiar types but the sincere performances make them work. In short, Alien Outpost defies the potential pitfalls of the found footage film and comes out a winner thanks to its investment in craftsmanship at all levels. Even those who are skeptics toward this genre trend are likely to walk away with respect for what it achieves under this banner. Blu-Ray Notes: Scream Factory just gave this title its debut on blu-ray. The transfer does well by the digital cinematography, giving it plenty of color and sharpness to the details. Both 7.0 and 2.0 lossless stereo mixes are included. The 7.0 mix was listened to for this review and it’s a dynamic, layered mix that really uses the surround speakers during the battle scenes. Scream Factory also includes a nice little package of extras. It starts with a Raisani/Clifton commentary track that goes into great detail on working with the actors and the rigors of shooting action as realistically as possible. “Cast And Crew Interviews” is a slickly edited featurette that runs just over 116 minutes. In addition to the expected talking heads EPK-style material, it also offers some insight into how the visuals and plotting were built around the documentary approach and some cool info on how the alien suit was created. “Deleted scenes” is just under four minutes and offers mostly atmosphere and expositional material. A pair of trailers close the extras out, both selling the film’s sci-fi/war movie blend well. In short, this is a worthy presentation of the film and worth the time for genre buffs.